German Chancellor to Obama: Have You Hacked My Phone? 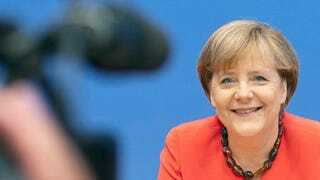 Angela Merkel, the Chancellor of Germany, spoke to Barack Obama on Wednesday evening to demand explanations over reports suggesting that the NSA has been monitoring her mobile phone. According to the Guardian, sources claim that Merkel, the head of the German government, was "livid" over the reports. What's more, leaning on German intelligence and investigations by the German news weekly Der Spiegel, she was apparently convinced that the claims were "utterly substantiated". That conviction of belief was enough to see her call Obama, telling him that she expected the Americans "to supply information over the possible scale of such eavesdropping practices against Germany and reply to questions that the federal government asked months ago."